The TW9 Duo from Myphone is a full capacitive touch screen with WiFi. 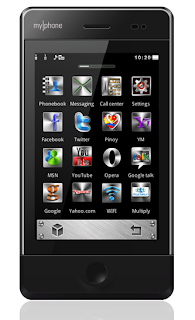 It's screen size is about 3.5" with a 480 x 320 pixels, it screen size is one of the largest that Myphone made. This cellphone is sleek and resembles an Ipod except the side of this cellphone which runs almost at the edges. This TW9 from Myphone only has one function key located at lower center of the phone. It offers a dual SIM capability like other Myphone cellphones, which is perfect for a Philippines setting because of the number of telecom companies that offer services.